New art gallery opens in Rehoboth tomorrow! Located at 20 Baltimore Avenue in the heart of Rehoboth Beach, GALLERY C is the area's latest contemporary fine art display space. The new gallery is host to monthly exhibitions featuring original works of contemporary fine art by regional, national, and international artists. Gallery exhibitions will be curated by my good friend and acclaimed visual artist Michael Sprouse, who is also Executive Director of the gallery. Sprouse was the owner and curator for the acclaimed Eklektikos Gallery of Art in Washington, DC for 11 years prior to moving to the Rehoboth Beach area in 2002. The reception is from 6 pm - 9 pm, on Saturday, June 27th, 2009; meet the artists and enjoy complimentary wine and hors d'oeuvres, courtesy of Lupo Di Mare, OVATIONS restaraunt & lounge, and others). Wanna go to a Philly opening tonight? 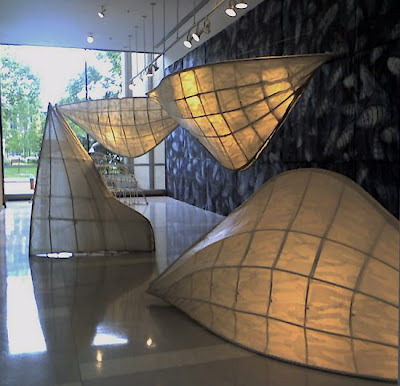 The Persistent Dream is a mixed media installation by Frank Hyder at the Moore College of Art and Design in Philadelphia, curated by Lorie Mertes. The show opens tonight! This exhibition brings together elements from Hyder's recent explorations of forms and dream-like images in both two and three dimensions. The majestic space of the College entrance lends a satisfying combination of dramatic exterior and interior views of these new works. Opening Friday, June 26 - 6 to 8 p.m.